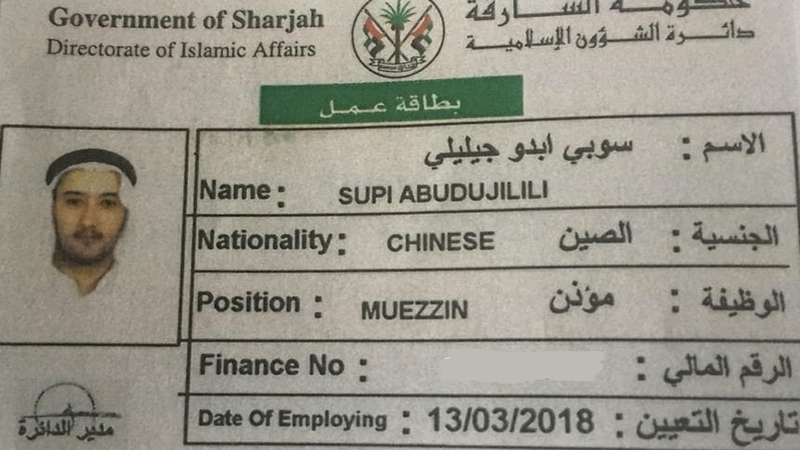 Relatives have no knowledge of what has happened to Abudujilili Supi after his arrest in the UAE last week. The family of a Uighur man detained in theUnited Arab Emirates has expressed concern that he will be deported to China, where the largely Muslim ethnic group are subject to an array of repressive measures. Emirati police officers arrested Abudujilili Supi on Thursday after he left afternoon prayers at the Abdullah bin Rawaha mosque in Sharjah, where he worked as a muezzin, the person who calls the prayer at mosques. Supi’s wife, who witnessed the arrest, received no explanation about why her husband was being taken away but received a phone call from him three days later. In that conversation, Supi told his wife, who has since fled to Turkey, that he was being sent to China and that authorities had yet to respond to his request to be sent to a safer country. Supi spent four years studying Arabic and Islamic studies in Cairo before moving to the UAE, where his family said he resided legally. While in Egypt, he had visited China twice on holiday without issue. But by early this year, reports were starting to surface detailing Beijing’s increasing repression of the Uighurs and other Muslim groups. Chinese officials have banned Islamic rituals, such as fasting during Ramadan, and established what they called “re-education” camps to force Uighurs to give up Islamic practices in the country’s Xinjiang region. Instead, he believes his brother’s arrest is part of China’s move to extend its persecution of the community to Uighurs living abroad. In July, Chinese President Xi Jinping visited the UAE, becoming the first leader of China to do so in 29 years. During the visit, the UAE and China announced a “comprehensive strategic partnership” to “enhance cooperation in all fields to higher levels”. The largely Muslim Turkic speaking minority has long complained of persecution by China but the situation has dramatically escalated this year with reports that more than a million Uighurs are being held in what activists call “concentration camps” in Xinjiang. China rejects the description, but rights groups and the UN have called on Beijing to release the prisoners dismissing the “pretext of fighting terrorism”. “In virtually all cases of Uighurs returning home, they are sent to the mass internment camps,” said Rian Thum, a historian of Islam in China, adding authorities used a number of means to exert pressure on Uighurs living abroad, including recruiting informants and the use of family members still in Xinjiang to pressure exiles to return home. Is China holding Uighur Muslims in secret camps? Uighurs believe China is exerting its considerable diplomatic muscle to pressure members of the community living abroad, and that Muslim countries, where many have sought refuge have barely reacted to the persecution of their co-religionists. “Many Uighurs are frustrated by a general slowness to act and indifference across the world, which of course includes Muslim-majority states,” said Thum. “Uighur exiles are well aware that they are much more likely to be protected from China if they are in the European Union, Canada, or the United States, than they are in almost any Muslim majority country.